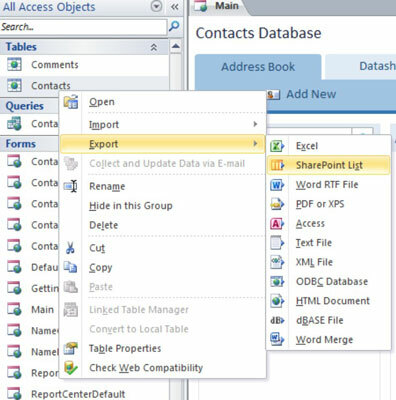 From your database, right-click on the table on the left pane and select Export. Select SharePoint list from the drop-down menu. In the Export data to SharePoint list window, enter the URL of your SharePoint site and specify the name for the new list. Unless you deselected the check box next to the Open the list when finished option, the new SharePoint list will open when the export is successful. From your SharePoint list, members of your organization can now add new items and modify or delete existing items. Take note that this SharePoint list is now a stand-alone list that is not connected to your Access database. If you want to manipulate this list in Access, however, you have to open the SharePoint list into a new Access file by clicking the Open with Access button from the Ribbon and following the prompts. If you choose to link the data from the SharePoint site to your Access file, updates that you make on Access will be reflected on the SharePoint list and vice versa. You can have multiple SharePoint lists pulled into one Access file, giving you the ability to create client object queries and reports that can pull data from multiple SharePoint list sources.